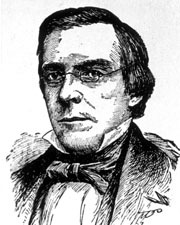 CHARLTON, Robert Milledge, a Senator from Georgia; born in Savannah, Ga., January 19, 1807; studied law; admitted to the bar and commenced practice in Savannah; member, State house of representatives; United States district attorney; elected a judge of the superior court in 1832; appointed as a Democrat to the United States Senate to fill the vacancy caused by the resignation of John Macpherson Berrien and served from May 31, 1852, to March 3, 1853; mayor of Savannah; died in Savannah, Chatham County, Ga., January 18, 1854; interment in Laurel Grove Cemetery. Mellichamp, Josephine. Robert Charlton. pp.131-33. In Senators From Georgia. Huntsville, Ala.: Strode Publishers, 1976.